We’ve already spotted Hilary Duff in Sigerson Morrison “Kyeran” boots paired with skinny jeans, a mini skirt, a black tuxedo blazer, mid rise jeans, and red pants. She took her favorite boots out for another stroll on Wednesday afternoon in Beverly Hills. The 27-year-old entertainer walked her son to preschool in dark-washed skinny jeans by GOLDSIGN paired with a silk tee by Raquel Allegra. Hilary accessorized with Dior aviator sunglasses and a crossbody bag by Celine. Her outfit was completed with a pair of short western “Kyeran” booties from Belle by Sigerson Morrison. Her stacked heel and hidden wedge booties have unfortunately sold out, but you can find plenty of other boots from the same designer on sale at Shopbop. 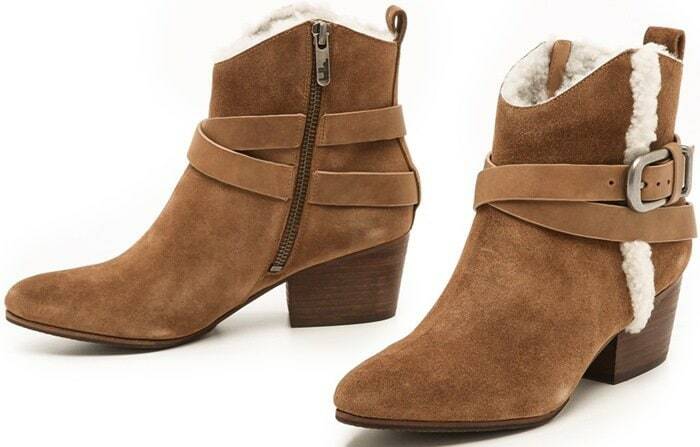 See for example these pointy-toe shearling booties that have been discounted by 50%. How do you like Hilary’s casual outfit? Let us know by leaving a comment below!